Trudging through mud, hopping over fire, crawling beneath barbed wire? Piece of cake. If you follow this routine from Nathan Trenteseaux, owner of Underground Fitness Revolution, a member of the Fitness Revolution Nation, in Alachua, Florida, you'll be fully prepared for the obstacles in the Warrior Dash, Tough Mudder, Spartan Race, or a local version of these adventure races sweeping the nation. Trenteseaux knows from experience what works. In addition to being an expert in metabolic body-weight training, Trenteseaux says mud runs are his "latest obsession." He even has a tattoo of the Tough Mudder logo he received after completing the 12-mile race this past December. Its purpose: To make sure you can complete each obstacle successfully, and without getting so winded that you have to stop and catch your breath. "People who struggle with these events spend too much time running and not enough time developing the upper body strength and skills necessary for the obstacles," says Trenteseaux. 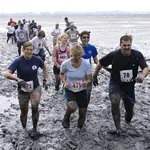 "For those already in shape and running on a regular basis, some form of high-intensity total-body resistance training is crucial to provide the other components needed for a mud run." Trenteseaux selected these movements because they have the most real-world carryover to the obstacles you'll see in a typical mud run. The spider lunge, for example, will open up your hips, a notoriously tight spot for men, so you can crawl under barbed wire. Bupees, pushups, and pull-ups will help you scale a wall, climb a cargo net, or swing across monkey bars.